Here is a video of my workshop as of late May: Workshop Video. It’s a full-on place now, layered in delightful smells of all different cut woods, and cut stone, and metal, with nooks and crannies where all manner of potentially useful or rare/unique items dwell, and of half spun ideas too. For example, and this is a good example, , you can see the Hotei Buddha there on the right – you know, the joyous one, almost always has his arms up in the air, exultant – all that. And you know I’ve been wanting to make my own wooden Hotei Buddha forever, or at least since I’ve been dragging this guy along since has to be 1985 or 1984. Even been gathering up suitable pieces of wood – sizing them up. And then if you click on the picture you’ll notice in the center right that there’s something of a compound puck there. And that’s indeed what it is, no need to ask why. I don’t ask why when the need to do something comes over me. Anyway, then I balanced the puck on the upraised hands of Hotei and I liked it. The idea that he is still exultant, that now it is not perhaps his freedom that is animating his exultation, but rather his strength, his work. 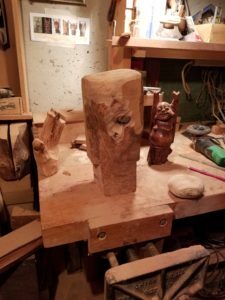 That I liked a lot, enough to start carving. Turns out I had a beautiful piece of live oak just waiting. Probably been drying in the shop for two years, and it came in supposedly dry. Barely a crack in it. A knot or two, ok. Removing big material gracefully is the first challenge of carving. Angle grinder?! Engine of danger and terror? Extreme concentration is mandatory. Look to the right of the Buddha and you will see the fearsome teeth. Expand the picture. Anyhow, so angle grinding and table-sawing I go for a half an hour or so, recognizing that this is not going to be a quick and easy thing at all, when suddenly the Assyrian emerges. I’m not joking. They say how things are revealed when you carve, or how you reveal something. I’m not saying that I saw the Assyrian and in a collection of masterly strokes revealed him, rather that by random happenstance he appeared. What Assyrian you say? Look at the picture again. Before you expand it, imagine a 3/4 profile nose right. See the knot as the eye. See the lighter area in the center right as the nose. See the little jut 2/3 down on the right as the chin and likewise the jut on the left as the hair or helmet. A fierce fellow indeed! I do not think I have a duty to change direction and abandon the workful joyous Hotei for this Assyrian, but I do think he deserved mention and that the question of when to change direction in a representation also deserves consideration. Hopefully I will check back in here with images of the completed Buddha. This post really was about the workshop video, but in a way this story of the things that happen in the process, and the things that happen before the process, these things really explain the workshop better than any attempt to do so directly. This entry was posted in Investigations, Making Things by prd. Bookmark the permalink. Let.s have a reunion-bring ice fishing equip.